In case you don't already know, I absolutely love running into old letters written by former Dodgers'. Oftentimes, they provide a little glimpse at their personalities, and insight into their character. Other times, we get a look at what's going on behind the scenes. Go here to check out all of my previous post on Dodgers' Correspondence. Above, is a letter currently on auction at REA that I wanted to pass along. It is written the day after Christmas 1917. Hall of Fame manager Wilbert "Uncle Robbie" Robinson reaches out to fellow Hall of Famer Zach Wheat about the upcoming season. Check out the auction here. 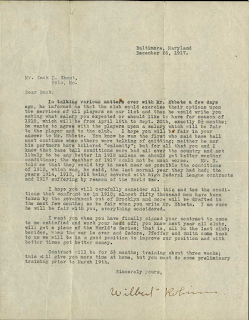 In talking various matters over with Mr. Ebbets a few days ago, he informed me that the club would exercise their options upon the services of all the players on our list and then he would write you asking what salary you expected or should like to have for season of 1918, which will be from April 16th to Sept. 30th, exactly 5 1/2 months: he wants to agree with the players upon a salary which will be fair to the player and to the club. I hope you will be fair in your answer to Mr. Ebbets. You know he was the first who said base ball must continue when others were talking of quitting; neither he nor his partners have hollered "calamity"; but for all that you and I know that base ball conditions were bad all over the country and not likely to be any better in 1918 unless we should get better weather conditions; the weather of 1917 could not be much worse. Mr. E. told me that they would try and meet near as possible the conditions of 1913, which was, he said, the last normal year they had had; the years 1914, 1915, 1916, being covered with high Federal League contracts and 1917 suffering by reason of the World War. 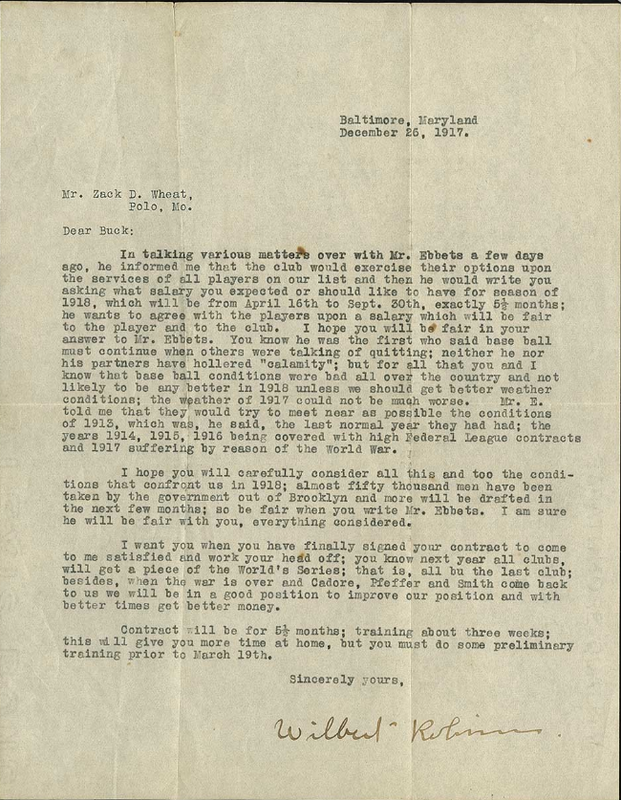 I hope you will carefully consider all this and too the conditions that confront us in 1918; almost fifty thousand men have been taken by the government out of Brooklyn and more will be drafted in the next few months; so be fair when you write Mr. Ebbets. I am sure he will be fair with you, everything considered. I want you when you have finally signed your contract to come to me satisfied and work your head off; you know next year all clubs will get a piece of the World's Series; that is, all but the last club; besides, when the war is over and Cadore, Pfeffer and Smith come back to us we will be in a good position to improve our position and with better times get better money. Contract will be for 5 1/2 months; training about three weeks; this will give you more time at home, but you must do some preliminary training prior to March 19th. I find it interesting that during an era when players were roundly beaten up by the owners, Zach Wheat appears to have significant leverage. He was their top player; therefore their top draw. Considering, as Robbie mentions above, that a large swath of fans were off to war the Dodgers needed to make sure there was someone on the field the populace would enjoy watching. Clearly, Wheat was that man, and as the stats tell us he definitely proved to be a keeper. In 1918 he hit a league leading .335. Unfortunately, the Robins, as they were known back then, finished the season in 5th place in the National League.